Excellent shape cruiser that is FULLY equipped. Wood recently refinished. Needs absolutely nothing. Currently in the water. An excellent pocket cruiser that can be enjoyed immediately without any work. Cabin looks like show room condition and the rest of the boat is in excellent shape as well. A great way to skip thousands of dollars in marina fees a year! Boat was reconditioned to like-new condition 4 years ago. I just got it ready for the season and would like to now find a bigger boat. Will sleep 4. Sails like a 27 foot. I’ve done solo trips 15 hrs with this boat! I’ve even crossed lake michigan. 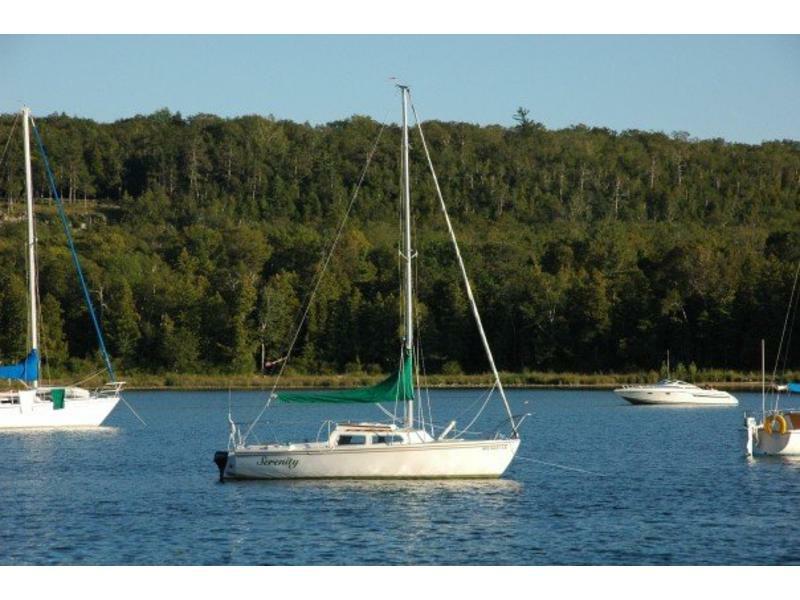 You can buy this boat and use it the day you buy it and have it be in excellent condition. I would be glad to drive down to the marina and snap pictures of anything you are interested in within 24 hours (or sooner). Price is $6200 with all included electronics OBO. Willing to negotiate. just ask! 9.9 Johnson longshaft outboard with electric start. Trailer with tongue extension. Swing Keel. Rollerfurling with 150% Genoa in good condition. New main last season. Wood refinished last season. Port-a-potty. Galley with stove and sink. 110 volt air conditioning. GPS. Autohelm Autopilot. All new rigging and lines 4 years ago. Original cushions in like-new condition (very rare!). Magma Grill. 2-year-old VHF radio. Everything on the boat works and is in great shape. Custom manufactured bilge drop-in compartments made by mid america plastics for safe, dry, and secure storage. Pop-Up top cover (never used personally.